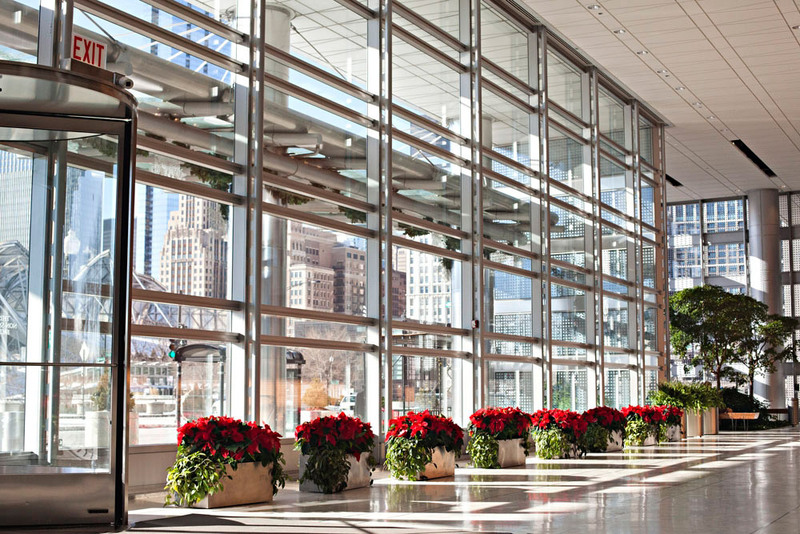 Add poinsettias to existing planters for budget-friendly holiday decor. We get a lot of requests to decorate offices and homes for the holidays so I thought I’d share a few tips on how we approach these fun projects. This week I’ll talk about office holiday decorations; next week I’ll focus on trimming your home for the holidays. When we bring the holidays to a corporate office, we always keep in mind that a business should reflect a less personal style. That said, we do incorporate what is important to that client. For example, if the business’s branding includes a defined color – such as Target’s red or UPS’s brown – we blend that into the theme, using touches that blend that corporate color into the décor. Garland with ribbons and ornaments is a holiday-neutral way to bring seasonal warmth to any business. Similarly, if the business is oriented toward children, we would create a more whimsical display with toys. But if it is an office of attorneys, we would of course lean toward a classy, less disruptive look. Even though the holidays are a time of celebration and joy, an office should still reflect the business’s brand and purpose. • Use an artificial tree that requires no maintenance but employ candles, oil diffusers or plug-ins to provide a pleasant pine scent. • Decorate the tree with items pertinent to the business for an amusing touch – such as tongue depressors and pill bottles in a doctor’s office or small books and pens at a publishing firm. 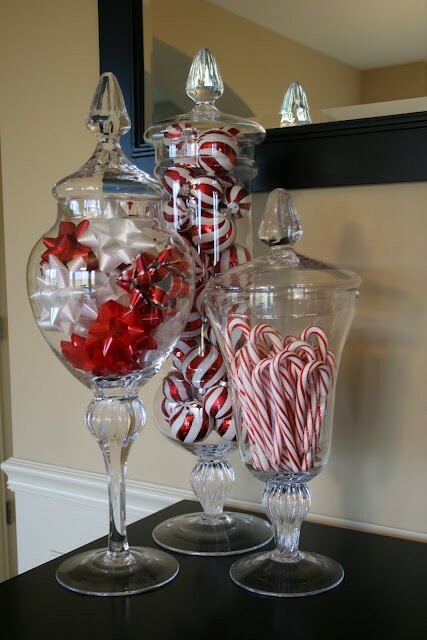 Jars filled with candy, ribbon or ornaments provide color without clutter in a busy office. • Battery-operated garland and wreaths add greenery, light and texture without needing an electrical outlet, which can be hard to find in lobbies and offices. 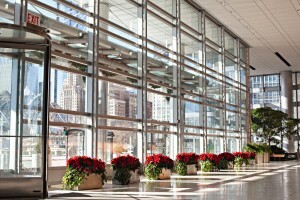 • Poinsettias add an immediate pop of color and holiday charm to even the most formal office. • Wrap empty boxes as “gifts” to place under the tree, or stack different shapes and sizes as mini displays. Unless the office is very casual, choose seasonal wrap in coordinating colors. 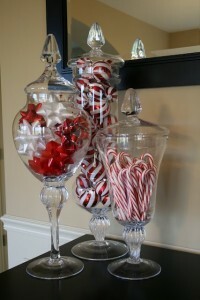 • Fill clear glass apothecary jars in different shapes and sizes with candy or other holiday sweets. Your clients and staff will appreciate the treats! The most important aspect to successful holiday decorating at a business is considering who will see it. If your business has multiple publics, think traditional but creative, avoiding any specific holiday to eliminate bias. 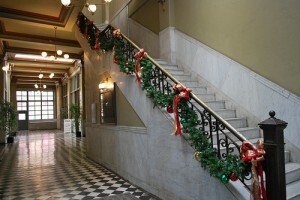 May we assist you in decorating your business for the holidays? Please contact us.